Chatter Glass | A WordPress.com site with chatter about stained glass crafts. Today I want to chatter about glass cleaning products that are used on kiln-fired glass, discovering who’s using what and talking about what works and why, and then talk about how you can make or choose the best glass cleaner. If you’re hoping to read about ordinary household window cleaning products then this blog is unlikely to be of interest, although I will make some passing comments that you may find helpful. A key motivation is to ask why we pay for a brand name when a generic product or home-made product does the same job, sometimes better, and is cheaper? You might suppose that there’s something special in the branded product but often you’ll discover it’s nothing more than an uninspired formulation of standard raw materials. Another motivation is to consider why we use glass cleaning product. There are people who use commercial products just as there are others that do not clean their glass before putting it into a kiln. It’s all rather confusing when all you want to do is reduce the incidence of devitrification on you glass masterpiece. A third motivation is to consider some of the questionable advice found on the Internet when one cleaning product is often recommended in preference for another but without clear reasoning or justification. The boiled-down essence of “perceived wisdom” is that we need to do whatever is necessary to reduce the number of nucleation sites on the surface of our fusing glass which could lead to devitrification. Basically, it’s any kind of “muck” on the surfaces of your glass that form these nucleation sites that can provoke the devitrification process. The process of devitrification is the result of normally amorphous crystalline glass changing progressively into regular crystalline glass. If you are a keen and enthusiastic learner have a look here to understand more about crystal formation, paying particular attention to the section about “heterogenous nucleation”. The reason that some people get obsessive about cleaning glass before use is that they believe even the merest hint of a fingerprint or dust on glass will result in devitrification. Others suspect it’s perhaps just a big conspiracy theory, believing that any contaminant on glass will simply burn away, just as white PVA glue or Glastac is supposed to do. Think about both sides of the argument because both sides can’t be simultaneously true but both have some truth to them. The bottom line is that if we really want to clean our glass then something we must hold in our minds is that a glass cleaner should evaporate and not leave any residues whatsoever if it is to leave your glass in a pure unsullied state. It’s maybe a good idea to start by finding some examples of who is using what to prepare their glass for firing. We can then look at what’s in those products to understand why they work and why they might not be ideal formulations. Over here in 2010 we find Spartan Glass Cleaner being recommended by someone from Bullseye in response to a mention of a professional glass cleaner from Bohle being used by someone who has a problem. This forum thread is particularly interesting because the advice is well-meant but smacks of “product placement” because Bullseye sell Spartan Glass Cleaner. Elsewhere I see another “product placement” in the same forum in 2010 where a lack of understanding that “rubbing alcohol” and “denatured alcohol” are not the same thing leads to another “product placement” for Spartan Glass Cleaner, again by someone from Bullseye. Overall, this forum thread gets my vote for whacky advice and mis-information. If you look for Bohle glass cleaner you find you’ll find that they actually produce more than one product. Find their safety data sheets here and study them, looking for the section in which you find their ingredients. You will find their glass cleaners contain isopropyl alcohol and a surfactant called 2-butoxyethanol. We will individually consider these chemical components later. We now move on to the aforementioned “Spartan Glass Cleaner” and you will also find that Spartan Chemicals make several glass cleaners. The particular Spartan product that Bullseye sell here seems to be this product from Spartan Chemical and lower down on the same page you’ll find the safety data sheets in three languages, the American language version being here. From the manufacturer’s safety data sheet we learn that Spartan Glass Cleaner contains mostly water, some isopropanol and a little acetic acid. Curiously the safety data sheet for the product suggests a “floral fragrance” which I can only assume means the addition of a small amount of unlisted perfume to mask the acrid smell of acetic acid. Rubbing alcohol has been mentioned in the forums. It has a strange name because it describes the intended use rather than a specific chemical. So, as you’ll find at Wikipedia’s page for rubbing alcohol it’s likely to be some water with either isopropyl alcohol or ethanol with the possible addition of various additives, some some of which may make it taste bitter and undrinkable and others that have mild medicinal qualities. This lends some credence to a forum contributor here that says rubbing alcohols “sometimes contains impurities, like oils”. Therefore, in summary, rubbing alcohol is an ill-defined product that is mainly made using alcohols that will quickly evaporate but may also contain additions that will not evaporate after cleaning our glass, leaving a small amount of residue. These ill-defined additions are a possible trigger for devitrification if they do not cleanly burn off in a kiln. Denatured alcohol is also known as methylated spirits and is a mixture of chemicals though typically it is ethanol that dominates, with the addition of some water. It is difficult to pin down precisely what the formulation is because many possible additives are added to the ethanol to make it taste bitter and undrinkable. Whatever the mixture, the alcohols will evaporate completely and quickly because they are volatile, just as they will do for rubbing alcohol. Other additive, such as dyes and bitter-tasting denatonium (as with rubbing alcohol) are a possible trigger for devitrification if they do not cleanly burn off in a kiln. Here I just want to make a few passing comments about what we might call a general purpose window cleaning products. By this I mean something you’d choose to routinely use in a domestic setting. My first observation is that I don’t really see how Spartan Glass Cleaner can be considered to be special. It certainly does not appear to be specifically designed for our precious fusing glass. More to the point, the formulation appears to be what one might expect from a general purpose window cleaning product (by virtue of the vinegar and having a fragrance) and indeed it seems to be sold by Spartan Chemicals as a general purpose glass and window cleaning concentrate. A similar observation can be made regarding the Bohle glass cleaners as they too do not appear to be specifically designed for our precious fusing glass. There is however one very useful comment mentioned here that warns us to avoid extremes of pH (meaning acidity or alkalinity) because they can attack metallic structures such as lead or zinc cames. In other words, glass cleaners that contain ammonia or vinegar at significant concentrations should be avoided. However, because we spray our windows with products that contain only low concentrations of ammonia (or vinegar) then wipe it all away within minutes I fail to understand how any damage can be done to the glass itself and there is little time available to corrode metal work. We have now looked at four products that have been mentioned in forum threads and I’m sure that many others could be added. But let’s press on to the interesting stuff. It’s time to consider the key chemicals from which they are made so that we can better understand what’s good, what’s not and why. Water is a common ingredient. As we all know, pure water boils at 100 °C and should be neither acidic nor alkaline. Water is probably the most familiar solvent we use and it will not easily cause our glass to devitrify. It is a cheap chemical because it’s so abundant, even if we choose to pay extra for deionised water or even more for distilled water because we don’t have a nice clean soft water supply coming from out taps (American: faucets). The only concern here is the use of hard water because of the dissolved minerals which might come out of solution when cleaning glass because tiny mineral particles can act as nucleation points for devitrification. With regard to distilled vs. deionised water I note that although distilled water is very pure, it should be noted that deionised water has the ionic mineral components removed so is much cheaper to produce and just as usable as distilled water for cleaning glass. Sometimes spending that extra money doesn’t really give you any significant advantage. Isopropyl alcohol has many chemical synonyms such as isopropanol, propanol and propan-1-ol. We’ve already seen isopropyl alcohol mentioned in the safety data sheets for both of the commercial products as well as for the rubbing alcohol (and possibly for denatured alcohol). So is important we know more about this particular alcohol. In essence, isopropyl alcohol is a pure chemical, not a commercial formulation, which means we can know exactly how it behaves. It is volatile with a boiling point of 82.6 °C which means it evaporates quickly and completely. It is neither an acid nor an alkali so it will not attack glass. It is an effective solvent in many situations and is also cheap to manufacture so you will find it being used in many diverse cleaning products. These are all good characteristics for a glass cleaner, explaining why each of our four example products involve isopropyl alcohol. 2-butoxyethanol has many synonyms of which 2-butoxyethan-1-ol is its favoured chemical name. In essence it’s another pure chemical, not a commercial formulation, which means we can know exactly how it behaves. It is a non-volatile solvent of low toxicity that has mild surfactant properties and has a mild sweet smell. In other words, it’s a gentle cleaning agent that doesn’t evaporate quickly so is useful for cleaning mucky glass. It has a boiling point of 171 °C which means that any of it that is not cleaned off our glass ought to evaporate completely in a kiln. Surfactants are something we’re more familiar with in washing-up liquid and other “harsher” household washing and cleaning products and the reason they’re often used is because they’re good at “lifting dirt”. Acetic acid is also known as ethanoic acid and when diluted we know it as vinegar. When in Britain, be sure to add some to your fish and chips (American: fries) if it’s of the malted vinegar variety. Acetic acid has a boiling point of 116 °C which means it should evaporate completely but not very quickly but we must remember that acetic acid is mixed with plenty of water to form what we know as vinegar. Vinegar has been used to clean things for time immemorial and is used in some glass cleaning formulations such as Spartan Glass Cleaner as promoted by Bullseye as well as domestic products such as Windowlene in the UK. It is a cheap and abundant chemical. It is a weak acid being used in small quantities, and because we don’t spend hours cleaning a piece of glass, it is unlikely to cause any problems for our fusing glass surfaces. Though not mentioned in the four products we’ve been looking into, it would be remiss of me to ignore ammonia which is a synonym for household ammonia and ammonium hydroxide. It does happen to be used in a Spartan glass cleaner promoted as being “fortified with ammonia” and you’ll find the MSDS here. But I digress. Ammonia is volatile and has a boiling point of around 27 °C and is a commonly used in small quantities, diluted in water, as a solvent in some household window cleaning products. Only because ammonia tends to be used in small quantities within window cleaning products, and because we don’t spend hours cleaning a piece of glass, can we assume the ammonia it is unlikely to cause any problems with our fusing glass. It just smells absolutely horrible. We can not identify the un-named but implied fragrance perfume in Spartan Glass Cleaner and can only assume that if it’s not causing Bullseye any problems. We can however guess that it’s probably some kind of organic molecule (or mixture) that successfully burns off in a kiln. But, if we are worried about devitrification and want to avoid contaminating the glass then shouldn’t we also want to avoid things like fragrance chemicals that aren’t needed to clean our glass? This is an interesting concept to consider! All I can suggest is that the only logical reason to add a perfume to a cleaning product is to mask the smell of something unpleasant – like vinegar or ammonia. And finally, I have one more chemical that deserves a mention because it’s rarely mentioned. It’s called acetone and is also known as propanone. Add some colour and perhaps some fragrance and we call it nail polish remover. Acetone is very volatile and has a boiling point of 100 °C which means it will quickly evaporate and leave no residues. It is neither acidic or alkaline so will not attack glass. The colorants and perfumes added to nail polish remover make it impure and therefore less desirable than pure acetone. The only link on the Internet I can recommend reading that knowledgeably relates to the use of acetone to clean glass is here. Having discovered and learned a little about chemicals that are commonly used, it’s time to trawl the Internet for more examples of what people are using to clean their glass. The best source I encountered comes from a long forum thread here at Fused Glass in 2008 that reveals many examples of what people do to clean their glass. What follows in this section is a brief summary of what caught my eye in that forum thread and I don’t suppose attitudes and behaviours have changed much in the succeeding decade. One person uses distilled water and vinegar, commenting that they use distilled water due to having a hard water supply. Avoiding hard water is a good idea because of the dissolved mineral that might come out of solution, leaving scummy particles that might just provoke the nucleation which cause devitrification. Again we see readily available vinegar being used. What is not clear is whether the water and vinegar are separate cleaning steps or whether they are mixed together. I personally would hope this person used the vinegar as a first step then rinsed using the distilled water. Another person uses hot water with a small amount of soap. This sounds reasonable because the soap and water will be effective with most kinds of contamination. The kind of soap is not mentioned though some (such as washing-up liquid) often contain surfactants (like the 2-butoxyethanol used in the Bohle glass cleaner) whereas others (particularly hand-made soaps) may contain an excess of oils and fats and might therefore leave a thin greasy residue which ought to burn off in the kiln. But for a good cleaning regime it is important to ensure that soap residues are completely removed with a thorough rinse. Another related comment in the forum thread is the use of warm water with a little dish soap followed by rubbing alcohol. I like this regime better than the previous example because there is a rational two-step regime. Not only does the alcohol rinse away any remaining dish soap but it also serves as a different kind of solvent. The only problem I have with this regime is that it is two steps which implies lots of time and effort. One contributor reveals what is, in effect, the reverse process, saying ” I use alcohol, then I wash it is very hot water & Dawn dishwashing soap”. Dawn dishwashing soap is what I’d call washing-up liquid, probably a perfumed, mixture of chemicals that includes a surfactant that should be well suited to removing a variety of contaminants. However, this regime would be more reliable and more effective if the alcohol was the second stage, if only to ensure that the washing-up liquid residues are completely removed by the alcohol wash.
And then there’s someone who uses an undefined alcohol and another who uses isopropyl alcohol. As we’ve seen with the Bohle and Spartan glass cleaners, alcohols are widely used because good for cleaning glass. A curious comment is from someone who says they attended a workshop at Bullseye and they use a mixture of 50% white vinegar and 50% denatured alcohol. This seems to be at odds with what the people from Bullseye have been saying in the forum threads I mentioned at the top of this blog though one might rationally argue that this forum thread is from 2008 whereas the people at Bullseye were recommending Spartan’s products in 2010. But regardless of this observation, the quantity of white vinegar being used seems to be rather excessive, even when we recall that vinegar is acetic acid diluted with lots of water. A small quantity of the white vinegar added to the alcohol would be just as effective and would not smell so horrible. In fact, I’d hazard a guess that omitting the vinegar would be equally effective. Of course, there are also some people who are using ordinary domestic window cleaning products. But, to be blunt, is that not what the Bullseye recommended Spartan glass cleaner and the Bohle glass cleaner seem to be? And, for completeness, I should mention that there were some people in the forum thread who’ve been told not to bother cleaning glass because the contaminants will all burn off. This is questionable advice because only the chemicals and contaminants that cleanly burn or evaporate will disappear and not cause a problem. Try burning off particles of grit for example! The quote below from the same forum thread at Fused Glass and I find interesting because it reminds us to question what we are told, do our own research and to not assume that a supposed expert is always right, whether the advice is from a face-to-face encounter with a real person or via the Internet. Detergents, dish soaps, multi-purpose cleaners, some window cleaners, ammonia and even denatured alcohol should not be used to clean glass. The Bullseye site suggests that you purchase a cleaner called Spartan Window Cleaner. Though well-meaning, it’s rather lacking in rigour. Where is the justification and reasoning to support any of this advice? More to the point, there’s a bland assumption that Spartan Window Cleaner must be a good choice because Bullseye recommend what they sell. Remember folks, I regularly and deliberately tell you to question everything you read on the Internet. I even tell you to not assume I know what I’m talking about. Don’t take my advice without question and likewise don’t take advice from anyone else without question. Think things through and make your own decisions. No matter what you decide to use for cleaning glass, if indeed you choose to clean your glass, just make sure the glass is cleaned thoroughly then buffed until it is dry. If you stop buffing when the glass is still wet then the contaminants dissolved in your glass cleaning liquid will be left behind (nicely smeared) on the glass surface when the remaining glass cleaning liquid evaporates. Use a lint-free cloth if you can for your drying and buffing, but if you can’t then try using good quality paper kitchen towels instead. Cheap paper kitchen towels can leave a residue of paper dust so try not to use such products. If you find that a piece of glass does not seem to be completely clean after trying to clean it with one kind of cleaning product then repeat using the same cleaning product if it previously made some good progress. Do remember that you can choose a different cleaning product for your second cleaning attempt, especially if the first cleaning product is having difficulties with the contaminant. Different cleaning products have different capabilities because they contain different solvents. If you are going to use a cleaning product that contains a soap or surfactant then consider a second rinsing to be sure the soap residue is removed. Be especially aware that some kinds of soap (particularly “super-fatted” hand-made soaps) may leave a thin greasy residue on the glass you just cleaned. 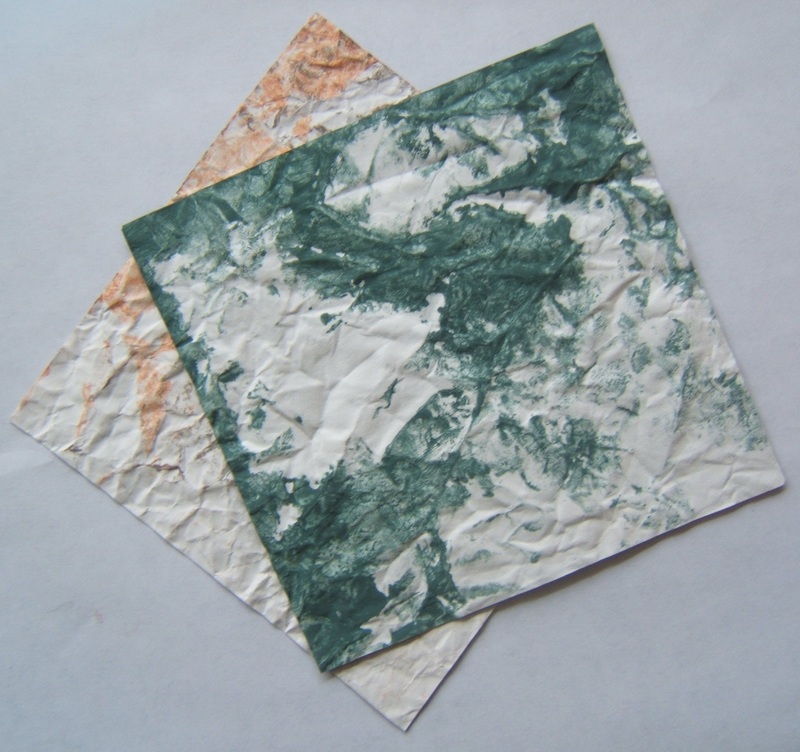 I am an advocate of using pure solvents that are devoid of non-essential additives. I therefore tend to use neat isopropyl alcohol or neat acetone as my cleaning solvents. But remember that I’m not afraid to pre-clean mucky glass with soap and water. Of all the recommendations I give you in this section, this is the paragraph I want you to remember! Isopropyl alcohol and acetone are volatile and flammable. Take care when you use cleaning products that contain these chemicals. Take care with acetone near plastics as it’s good at melting some of kinds of plastic! I believe that touching glass with a finger is overstated as a risk for devitrification if your hands are reasonably clean. I have found that white PVA glues are far worse than fingerprints for causing devitrification. So the simple advice here is to try washing your hands before you work with your glass! And finally, don’t get obsessive about glass cleaning. Just use a quick and effective cleaning regime that works. You should now be aware that several different chemicals can be found in glass cleaning products and that you now have an idea of what other people are using. You now also know that there’s nothing particularly special about expensive proprietary commercial glass cleaning products. You also know that water (soft, deionised or distilled), acetone and isopropyl alcohol are the key solvents you need to consider. Ideally, you will need to find a local supplier of “industrial chemicals” or maybe “industrial solvents” to buy your distilled or deionised water, isopropyl alcohol or acetone, but they should cost you a lot less that buying them from your local stained glass supplier. An example supplier that I’ve mentioned in the past is APC Pure. I don’t mention them because I work for them or get any commission from them. I simply mention them because they’re local to where I live and they’re an example of the kind of company you should be looking for. They also sell on eBay as do other chemical suppliers. Seek and ye shall find though it’s harder in some countries than others. If you choose to buy some isopropyl alcohol you should now realise that you can, if you wish, do things lilke dilute it with water and perhaps add some white vinegar to make your own version of the Spartan glass cleaner type of product. But I find it is best when the isopropyl alcohol is used at full strength and pure because it evaporates quickly and cleanly. You may also choose to buy some acetone. I find it will deal with contaminants that isopropyl alcohol struggles with (and vice versa). I always use it neat as it evaporates very quickly and cleanly. Don’t waste your money on branded products when you know about cheaper and better alternatives! “I’ve been told that [Fusemaster] Superspray has a shelf life of about 1 1/2 years. If that is true, and yours is fairly old, that might be the cause [of devitrification]”. Well, a search for the MSDS for this devitrification spray tells me it’s pretty-much powder frit added to ethyl alcohol with a tiny amount of isopropyl alcohol with some methyl isobutyl ketone as a surfactant. What struck me as interesting is that the three chemicals used to “carry” the glass powder seem to be remarkably similar to what we’d expect for a glass cleaning product. I can see the logic for using the two alcohols but I’m baffled why the surfactant is used, other then perhaps they are simply mixing a bought-in glass cleaning product and mixing it with clear glass powder frit. But back to the context of the original forum posting… Call me stupid if you like but I don’t think powdered frit has a shelf life. And I don’t ever recall seeing a “Best before” date on any window cleaning product I’ve ever seen in the past. In other words the devit spray can’t be the cause of the devitrification. Another example of well-meant poor advice I think! That’s all my chatter for today so all that remains is to remind all you “do it yourself” fans that I’ve already done postings that tell you how to make your own copper patina solution, safety flux and glass polishing compound. When firing a piece of clear-backed dichroic glass metal side down over a base of some other kind of glass we can produce a three-dimensional “well” effect. 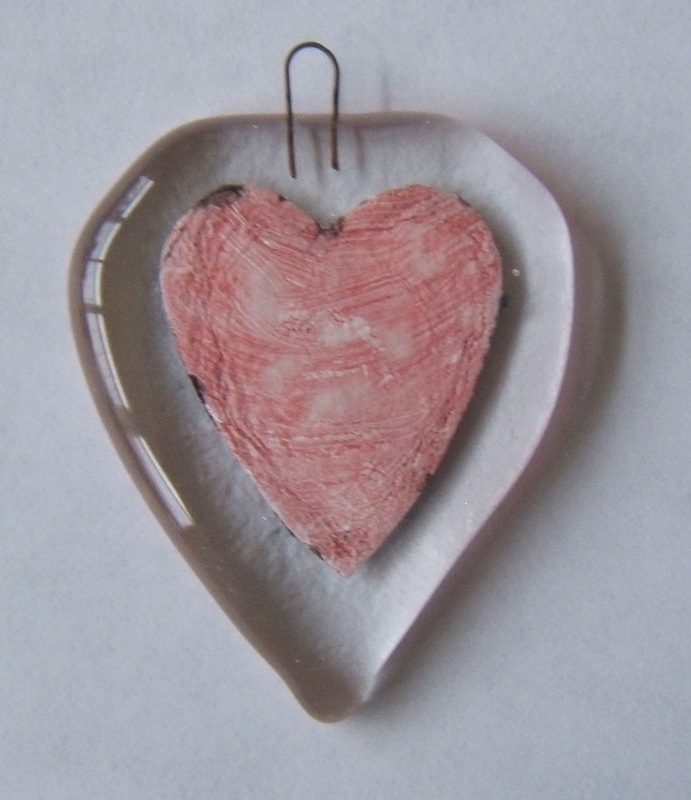 The problem is that it results in a messy-looking metal edge when we take it out of the kiln. On the right is a picture of what I mean. The left side illustrates what you can expect to happen without today’s tip. The right side shows that the problem can be managed, albeit not perfectly in this particular example. Although I earn no gold star for excellence with this particular experiment you can at least see there’s a distinct improvement. The questions to be answered are how the problem arises and how the problem can be eliminated or at least mitigated. 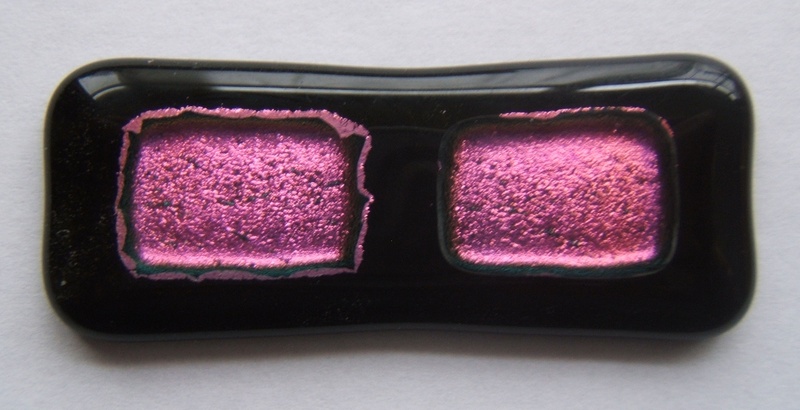 The problem arises because the clear-backed dichroic glass sinks into the glass base during the fusing process and leaves behind some of the metal layer at the edges. The answer to this problem is simple. Just grind away the dichroic metal layer from the edges of the piece of dichroic glass. This can be done very quickly with diamond pads for untextured dichroic glass but will be more fiddly with textured surfaces. To illustrate what you are aiming for, look at the diagram below. The lower area represents the base glass, the upper area represents the clear dichroic glass and the thick line represents the metal layer of the dichroic glass. Notice the angled undercutting at the lower edges of the dichroic glass and how some of the metal layer gets removed as a consequence. From this you will realise it’s not the angle of the undercutting that is important but the amount of metal layer that gets removed. Having said that, you’ll get better control over how much metal you remove with a reasonable angle that you’ll achieve with a really shallow angle. Exactly how much undercutting is needed to eliminate the problem primarily depends on the thickness of the dichroic glass layer. I also expect (but have not checked) that the amount of undercut will also depend on whether you are using a microwave kiln or a “proper” kiln. Start with a couple of millimetres of undercutting for your first experiment. Let practise and experience become your teacher. That’s all for now. Happy fusing. For your enjoyment I have gathered together details of well over a hundred old books that relate to glass in some form or another, all of which are easily accessible over the Internet. Whether it’s the glass sands of Kentucky, glass manufacture, glass painting, old trade catalogues, collecting glassware, making laboratory glassware, old Church windows or one of the many other strange topics relating to glass, there’s surely something for you somewhere in the list. I hope you find something that tickles your fancy. Although you’ll find the book list below within this blog I’m sure that some of you will want to “do your own thing”. So, I’ve created three alternative files that you can download and fiddle with. You could then sort your copy of the book list by title, date or author, improve the topic lists, add more books, or whatever else you might fancy doing. Make the downloaded files your own personalised bookshelf! Beware: Although the file names below have familiar file types like “.doc” and “.pdf”, they aren’t what they seem to be. I’ve had to do some simple “trickery” to enable you to download file types that WordPress, in its infinite wisdom, has chosen not to allow. So, be sure to read the text that follows the filenames before downloading them! Bookshelf-rtf.doc Actually this is not a “.doc” file, it’s a “.rtf” file. I had to rename it from “Bookshelf.rtf” to “Bookshelf-rtf.doc” before WordPress would to allow me to share it with you. So, please rename it back to “Bookshelf.rtf” once you’ve downloaded it. Let me explain… Unlike “.doc” files, “.rtf” rich text files are Microsoft’s only official “portable” file format for word processing documents. This means it can be loaded into many kinds of word processor applications and not just Microsoft Word. Use this file if you want to maintain and use the book list within your word processor. If this doesn’t work for you then try the Bookshelf.xls file format in your spreadsheet application and copy the table out of there into your word processor application. Bookshelf.xls This spreadsheet file really is an “.xls” file and it is saved in an old version of Microsoft Excel format so you don’t need Microsoft’s latest and greatest bloatware to use this file. It should work with some other spreadsheet applications too. Use this file if you want to maintain and use the book list as a spreadsheet. If this doesn’t work for you then try the Bookshelf.tsv file instead (see below). Bookshelf-tsv.pdf Actually this is not a “.pdf” file, it’s a “.tsv” file. I had to rename it from “Bookshelf.tsv” to “Bookshelf-tsv.pdf” before WordPress would to allow me to share it with you. So, please rename it back to “Bookshelf.tsv” once you’ve downloaded it. This is a “tab separated variable” file that can be loaded into most kinds of spreadsheet application, word processors and even some database applications. Treat this as your “last chance” file format because you’ll probably need to do some messing about to get what’s loaded into a nice useful state. Despite this it’ll be much quicker than trying to type everything manually. If you struggle and fail with all three file formats, or have a particular need for some other file format for use on something other than a Microslop Windoze machine then do let me know and I’ll try to help. The Title, Author and Date columns should uniquely and correctly identify each book but in some cases notes are added in square braces within the Title column to indicate something noteworthy, such as telling you that a different edition elsewhere in the table. Where a the title of a book title contains an ellipsis it is an indication that the full title was so long and verbose that it has been truncated. There were occasions when I reckoned the archive.org book details didn’t seem to be correct (for whatever reason) so occasionally you’ll find that information about titles, authors or dates in my table are not quite what you’ll find at archive.org. The Topics column gives an indication of what kind of information is found in the books and can be rather vague. Sometimes I’ve given you what the archivist recorded as the topics, if anything. Sometimes I’ve added to their topic lists and sometimes I had to create the topic list myself. A consequence is that the list of topics can be rather erratic but better than a poke in the eye with a blunt stick. The Location column contains one or more URL links that take you to a web page where you can download the book. It’s perhaps sad to note that many of the old books have been digitised multiple times whereas many other old books remain only as “hard copy”. After awhile I got bored with finding alternative sources for the books so stopped bothering. In all cases, visiting the URL will reveal a download available in PDF format. Often there are other file formats available as well. Alternative formats might be more suitable for use on a Kindle or mobile phone, for example. If you intend to download a copy of all the books in PDF format then you will need about 4GB of free disk space. Bear in mind that copyright laws in different countries are not the same. Distributing this list of books and their locations will not breach any copyright but distributing the scanned book images and expecting payment might. Here are the books I’ve found so far. There are even more out there! Oh, and sorry about the bad layout of the table. Despite messing around with the undelying HTML I can’t force WordPress to present the information tidily. The painter, gilder, and varnisher’s companion containing rules and regulations in everything relating to the arts of painting, gilding, varnishing, and glass staining …, 10th Edn. La Verrerie depuis les Temps les Plus Reculés Jusqu’à nos Jours, 2nd Edn. The Laboratory, or, School of Arts: Containing a large collection of valuable of secrets, experiments, and manual operations in arts and manufactures… Vol II, 6th Edn. The Laboratory, or, School of Arts: Containing a large collection of valuable of secrets, experiments, and manual operations in arts and manufactures… Vol I, 6th Edn. On some Optical Peculiarities of Ancient Painted Glass, in Proceedings of the Clifton Antiquarian Club for 1884/88-1909/12, Vol 1, pp 207-216. Stained glass work: a text-book for students and workers in glass. Well that’s all folks. Happy reading! Today I want to have a short chat about my experiences with Bullseye’s Glastac and some experiments with using CMC to thicken it. There’s no rocket science. I simply though you might enjoy another way to make use of your CMC. If you’re a glass fuser you’ve probably used Glastac. If you haven’t I recommend you try it. Glastac is a deliberately weak glue and in my experience it cleanly burns away in a kiln. It is useful because you can glue together the component parts of your glass masterpiece with the certain knowledge that you can re-place the parts for quite a long time. Better still, it helps to ensure your masterpiece will not fall apart when you are moving it to your kiln. As an aside, I caution against using white PVA glues, such as the oft-recommended Elmer’s Glue. Although I do use PVA glues occasionally, I have noticed that it does not always cleanly burn away and that it can cause damage to a glass surface. I particularly notice this when an excess of PVA is used. But I digress. The only problem I have found with Glastac, particularly when used in excess, is that surface tension sometimes drags small pieces of glass away from where I put them. Using less Glastac helps avoid this problem but the converse situation is that sparing use of Glastac means that the small pieces of glass are not sufficiently glued to stay put. And then I noticed that Bullseye had introduced Glastac in a gel form. Hmm. Thinks. Can I find the Manufacturer’s Safety Data Sheet (MSDS) to find out how it differs from the “old fashioned” Glastac? No, so it’s time to just experiment. Avid readers amongst you will remember that I’ve chattered about carboxymethylcellulose (CMC) on a number of occasions. Most of my chatterings were in Squirt Your Frits but I’ve also mentioned it in passing in other places such as converting ordinary safety flux into a gel form over at Make Your Own Safety Flux. This made me wonder if a little CMC gloop would thicken “old fashioned” Glastac and make it even better. Instructions on where to find CMC, what it is, how it works and how to make your own CMC gloop is covered in plenty of detail over in my Squirt Your Frits blog. I will not repeat all this information so read that blog and come back again if you need to. 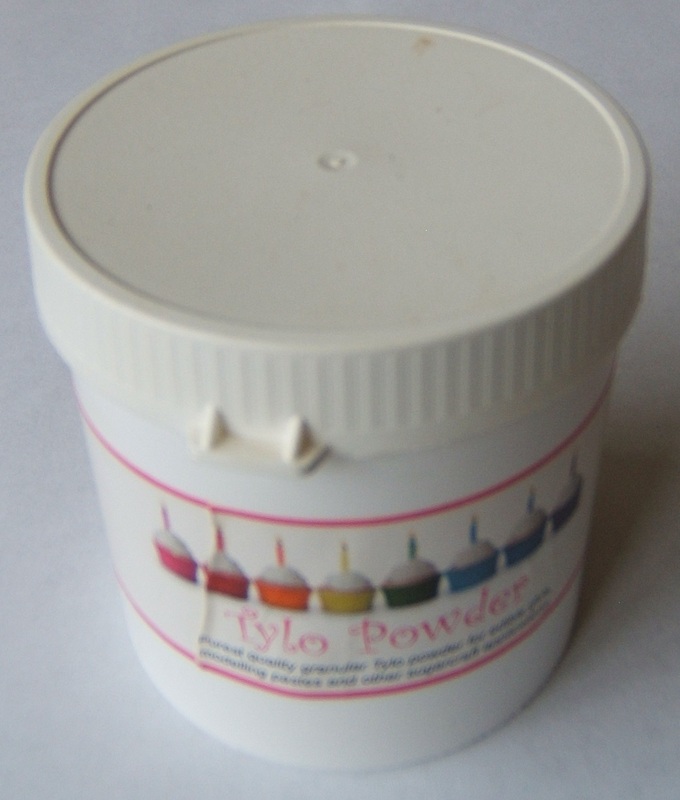 I will however show you pictures of a bottle of Glastac and (lower down) a little 100 gram pot of CMC sold under the “Tylo” brand name typically bought by sugar crafters. Making your own substitute for Bullseye’s Glastac Gel is a simple matter of thickening up some “old fashioned” Glastac with CMC. However the devil is, as they say, in the detail. I found it most convenient to start by making up some “sloppy” sol-phase CMC gel. The exact consistency does not matter. All you are aiming for is a CMC gel that is thick but flows reasonably slowly when you tip the container. Next, you need to find another little container and add some Glastac to some CMC gel and give it a thorough mixing. If the outcome is too thick, either add some more Glastac or add some water. If the outcome is too runny add some more CMC gel. As to the exact proportions of Glastac and CMC gel I can only report that making numerous little batches with differing proportions didn’t make seem to make any noticeable difference. As long as there’s a reasonable amount of Glastac in the mixture it’s going to be a glue. As long as there’s some CMC gel in the mixture it’s going to be thicker. In an attempt to make the homemade substitute dry quicker I tried using propanol in place of some of the water. There’s nothing special about propanol (also known as isopropyl alcohol). It’s just an industrial alcohol that is widely used as a solvent and as such it’s also useful for cleaning glass. Having said that, I mostly use acetone for cleaning glass. I didn’t notice any adverse effects of using this modified mixture other than the smell of evaporating propanol. I can’t really say that I noticed the glue drying noticeable quicker but to be fair I wasn’t conducting a proper controlled experiment against a stopwatch. So, I leave you with the thought that using an alcohol, such as propanol, should quicken the rate at which the glue dries but no convincing practical evidence. This is a prompt for you to continue the experiment and tell me! Although I have not compared this homemade Glastac gel mixture with the genuine Bullseye’s Glastac Gel I can at least tell you that I’ve had good results with the homemade substitute (with or without adding alcohol). The homemade mixture still works as a weak glue. The improvement is that it no longer seems to cause little glass pieces to slide and shift as the glue dries. Other advantages are that it’s quick, easy and cheap to produce in small quantities and you don’t need to find more space for yet another bottle of glue. If you find your homemade Glastac gel mixture works well you might consider buying some of the real Glastac Gel. At the worst it’s going to be no better. At best it’ll be even better. I found that leaving a small open pot of my homemade Glastac Gel substitute lying around for several weeks resulted in an “infection”. The feint tint of green near the surface leads me to suspect the beginnings of algal growth. Maybe I’ve discovered a new balanced diet for bugs. Hmm. But all is not lost. 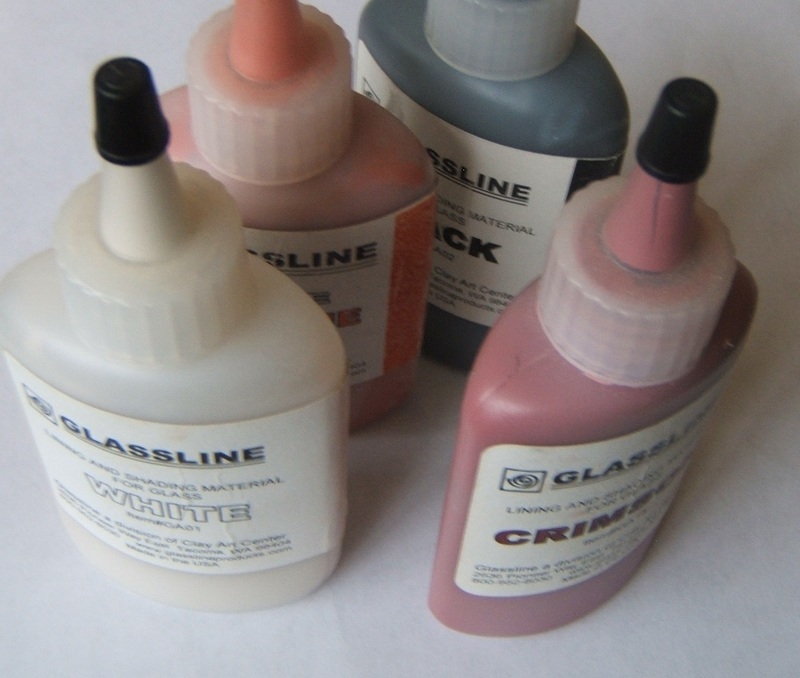 Simply make up your homemade Glastac gel mixture in small quantities when you need some. This does not mean you have to make up the CMC gel in small quantities. There is a shortcut. You may recall that I’ve already mentioned in Freeze Your Frits that your CMC gloop will freeze successfully. Store your excess in the freezer and make use of it a little at a time. If my early chattering about making globs from scraps of ordinary stained glass in Recycling Scraps of Stained Glass and with fusing glass at Waste Not Want Not have inspired you to make your own then maybe today’s blog will be of some interest. But only if you also do copper-foiled “Tiffany” style work. Reducing waste and saving the planet is a good ethic, but what’s the point if you don’t make use of them? I previously mentioned that kids enjoy collecting the recycled glass globs and that sometimes they can be used for pieces of jewellery too. Also, if you live in the land of deliberate bad spellers you might consider making jewelry with them instead. Today’s theme is all about making use of recycled globs in your copper-foiled “Tiffany” style work. Wrapping copper foil around a glob is a rather fiddly process. Not only is it a curved surface but it’s also rather smooth and slippery. The simple answer to this problem is to grind the edges of the globs so that you have a roughened surface against which the copper foil sticks more easily. Grinding can also be used to subtly re-shape a glob that has a defective or irregular shape. Once you have wrapped the globs with copper foil you’ll want to burnish the copper foil and make the globs ready for soldering. Use your fingers to gently push-in the upper and lower edges of the copper foil but do not waste too much time on this. All that you need to achieve is a crinkly edge that needs the burnishing “finished off” by a method that is less fiddly and more efficient than using a fid or Allnova tool. A simple and effective way to complete the burnishing process is to put your foiled globs into a jar with some un-foiled globs, put the lid on the jar, then shake until the burnishing process is complete. This trick is something I read on a forum years ago. So long ago that I don’t recall where or when. There’s no credit due to me for this burnishing method but I can at least recommend it. On the right you’ll see a picture of a “half pound” jar, some un-foiled globs and some foiled globs. Notice the relative quantities being used. Notice that the foiled-globs still have crinkly edges to their copper foiling. The number of un-foiled globs to use is not critical. It partly depends on the size of the jar just as it depends on how many foiled-globs are to be burnished. Too many globs in the jar means there’s not enough space for the globs to do their burnishing task. Too few globs in the jar means fewer impacts resulting in a slower burnishing process. You need to stop shaking as soon as the copper foil is burnished, otherwise the burnishing gets over-done and the copper foil starts to peel away from the globs. The picture on the right shows you the same foiled globs after burnishing. Good, eh? This noisy task is enjoyed by children but do bear in mind that child labour (labor) is likely to result in over-shaken globs because they are more interested in the noise than the degree of burnishing. To mitigate this problem, reduce the number of un-foiled globs (or maybe eliminate them) so that the burnishing process is slower, thus extending their acceptable period of fun and enjoyment. You might think that there’s nothing more for me to say about how to use some copper-foiled glass. But you’d be wrong. If writing some more means there’s less time for housework then I’m not going to be deterred. The privileges of childhood include the latitude to do stupid things like stuff small things up noses or in mouths. So, here’s an example of how I tend to use under-sized globs. Incidentally, it’s also a way by which I make use of the irregular shaped rectangles that we produce when squaring-off a wonky ends of newly purchased sheets of glass that were not accurately cut by the supplier. In this picture you see a small area of a finished abstract piece of copper-foiled work, the design of which is motivated more by the use of scrap glass than intentional artistry. Of greater note in consequence of the theme of this posting is the use of foiled globs. Of incidental interest is the use aforementioned irregular-shaped strips of glass that tend to arise from “squaring-off”. You can see that this particular example is not random. It may be a “sort-of rainbow” but in other pieces I arrange the globs such that they “sort-of flow” down through “sort-of cracks” between the irregular glass strips in the manner of “sort-of fractured rock”. Notice also that I’ve left a big hole (negative space) in the design. I also try to introduce excitement and interest by using different textures, differing opacity, slipping in a slice of agate or messing around with incomplete patination. Sometimes the best results come from not thinking too much! My second example is what can be done when you have a huge excess of globs and can’t bear to throw them out. From the picture you’ll see one end of a “box of bubbles”. Just like the previous example I’m using both flat glass, foiled globs and leaving some holes. Incidentally, have you noticed that I chose a Wissmach hammered green border glass to reinforce the “blobby” nature of the interior of the panel? There are two problems with this kind of panel. The first is that it can use up an awful lot of lead solder and the panels can get very heavy as a consequence. The second is that it’s very time consuming to make. So don’t make these panels too large and don’t expect to recover the real cost of making them if you intend to sell them! My final comments relate to the technical matter of soldering thick globs into a panel made with thinner glass. You will no doubt realise that the sheet glass will be about 3mm thick but the globs might be 6mm. So, the globs will tend to “stick out” at the front. If you want your globs to “stick out” only on the front of the panel then simply lay out the pieces front-side uppermost and get soldering without further ado. As an alternative you might try using thick card scraps underneath the plain glass pieces which then allows the globs to “sink” backwards into a more balanced and less proud form. So, there you have it. 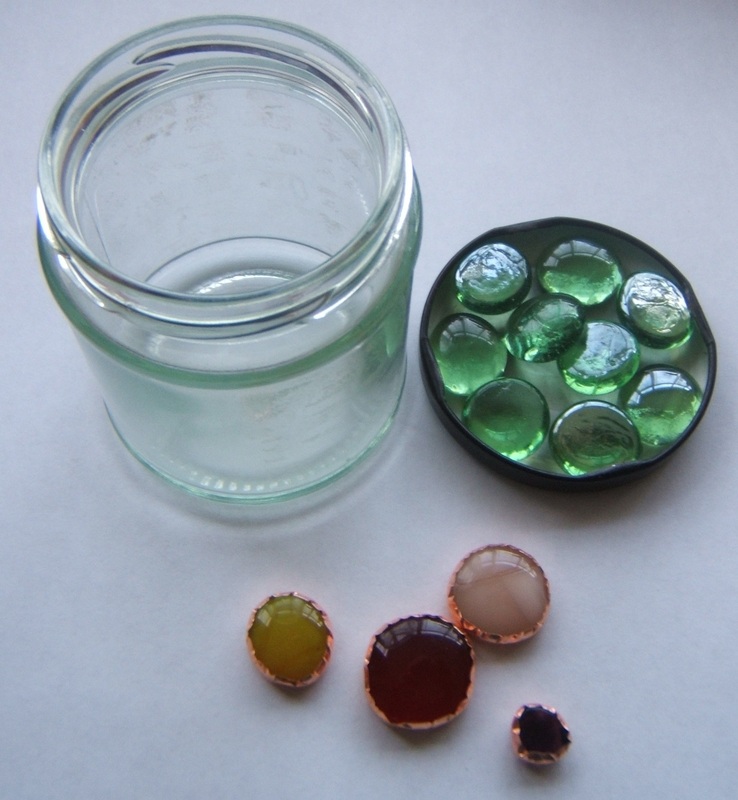 A couple more ways to save the planet by making use of recycled glass globs and a simple but effective way to burnish the copper foil onto globs. A mercifully short blog and not one hint of maths or science. Aren’t you the lucky ones?! Happy shaking and a happy (though belated) New Year. I’ve just bought my third Hot Pot Maxi microwave kiln. But, why buy yet another “toy” kiln when I already have a “proper” glass kiln of a distinctly robust and modern design? I hope to answer that question by talking about the distinctive nature of firing glass in a microwave kiln, a little about the economics of using them, and a little about how they work and how they deteriorate. I think I need to do all of this because I don’t see anyone else talking much about it. I still use a microwave kiln because I can melt a small arrangement of glass and have it back out and in my hands, fused and shiny, within about two hours. My “proper” kiln makes me wait a whole day (and night). So, speed and convenience is one reason. The barely-controllable ferocious heating in a microwave kiln results in a greater risk of glass cracking at it heats up and the lack of processing temperature control means it’s not uncommon to find a mutant distorted blob of glass is the unexpected result of a firing. And of course the small firing chamber means we don’t get to make anything larger than a brooch or pendant. Sometimes this is not a problem. The down-side of the almost uncontrollable heating, as I’ve just mentioned, is that the shape and form of the resulting glass masterpiece is rather unpredictable. This becomes a particular problem when the microwave kiln gets older and heats less evenly. I’ll be coming back to the “getting older” aspect of microwave kilns later as it seems to be a widely neglected topic! Another characteristic of microwave kilns is the incredibly rapid cooling inside the microwave kiln. It has scant regard for “proper annealing”. You might think that this must lead to problems but in truth it very rarely does. We are repeatedly told that it is important to properly anneal our work. From this we might suppose that the rapid cooling in a microwave kiln without “proper annealing” might cause us significant problems. In truth I find that breakages caused by poor annealing are very rare. If this is a surprise to you then consider the size of items being produced and realise there’s only so much stress and strain that can be built up and “stored” in such a small piece of glass. This is particularly the case for simple shapes like a blob of glass, a little decorated tile or a simple pendant – in other words, exactly the kinds of things that you’d use a microwave kiln for. You can, of course, pop your microwave kiln masterpieces into a “proper” kiln to “properly anneal” them though we can take paranoia too far sometimes. 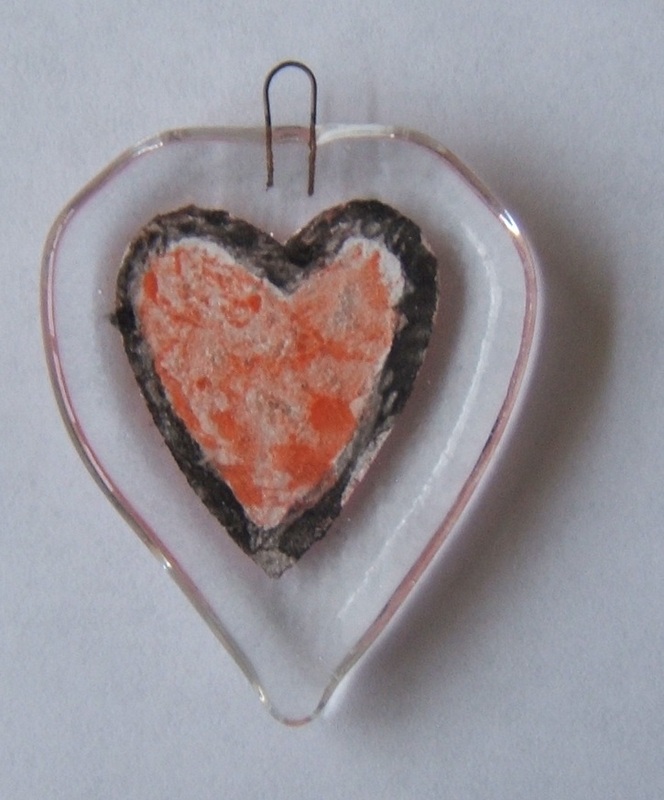 The big surprise is that my “proper” kiln fails to produce shiny globs with “ordinary” non-fusing glass. Devitrification is always a problem. Processing time is important when dealing with glass that was not designed to be re-fired. In other experiments, using a “proper” kiln, I find that most kinds of “ordinary” non-fusing glass can barely cope with slumping without devitrifying at least to some degree. Someday I’ll do a blog about this but I’ve not finished messing about yet! I can quickly and cheaply perform a simple glass-related experiment in a microwave kiln. Firing-up a big kiln and wait a whole day to find out what happened can be too long to wait sometimes. Children visiting for a “smashing time” can arrive in the morning to make something small and simple in a microwave kiln then take it home that same afternoon. While they wait for the microwave kiln too cool down they can also make something bigger and more “special” that later will go into the big kiln. Immediacy is important for kids, as is the excitement of seeing seething red-hot glass when they “peek”. I can recycle scraps of non-fusing glass into blobs without devitrification problems and in turn it means I throw very little waste glass away. I can quickly make small quantities of frit balls (and other similar little things) when I run out of them which means I don’t have to suspend my project work for a long time. That they’re badly annealed doesn’t matter here because they will be fired again! No matter how hard we try to make use of smaller pieces of glass we end up with small scraps that are unusable. Where possible unusable scraps get melted into globs. It makes environmental sense through I doubt the time and effort to make them is commercially viable. Some of the smaller globs (under 6 grams) I use in my own copper-foiled work or give away to other crafters when we meet at events. They might end up as a glass highlight in a wooden decoration for example. Larger globs (typically 6-10 grams) are supposed to be sold though I tend to give away most of them. My rule is simple – kids who show an interest in my work can have one free but horrible kids have to pay for them. There has to be a reward for being “nice”. I’ve already mentioned that I’m now on my third Hot Pot Maxi microwave kiln. What happened to the other two? As battered and bruised old-timers the old microwave kilns have been retired. They now live in landfill. The blunt truth is that they’re fragile, get damaged easily and really do get old and tired. I should now explain how a microwave kiln works (in brief) and then pull-in information to explain how and why they deteriorate and get old. The body of a microwave kiln is made of a light and brittle ceramic material. Considering how light and thin the ceramic material is, it performs remarkably well as a thermal insulator. Repetitive heating and cooling causes repetitive expansion and contraction which will result in hairline cracks. The brittle nature of the ceramic material (and the inside coating) of a microwave kiln means it starts rather soon and gets progressively worse the more you use the microwave kiln. Exactly where the hairline cracks appear depends on the unavoidable “defects” of manufacture and some basic physics. That the cracks always seem to run from top to bottom is purely down to the combination of geometry and coefficients of expansion – the inside gets hottest so wants to expand proportionately more than the outside. The reverse happens when cooling. This difference causes stresses and strains which result in hairline cracks appearing. So, don’t be unduly concerned by hairline cracks because they’re a natural consequence of the heating and cooling and the materials being used. We now need to remember some high school physics. Do you remember that heat can be transferred by any combination of conduction, convection or radiation? The hairline cracks will cause uneven heating because areas that heat up fastest can not conduct some of their heat to cooler areas because of the barrier caused by the cracks. So, any minor differences in one area heating up faster than another due to original manufacturing “defects” is made more pronounced when hairline cracks come into play. As the size of the firing chamber is so small we can assume there is no heat transfer by convection. There will however be some heat transfer by radiation because that’s what we’re using to heat up the glass in the firing chamber. So, uneven heating becomes an unavoidable and noticeable problem once the microwave kiln starts to develop hairline cracks. This in turn adds to the unpredictability of what you can produce in a microwave kiln. A partial answer to this uneven heating is to pause the firing mid-way, have a peek, rotate the lid by half a turn, then continue to the firing. With practise and good timing this can almost negate the effects of uneven heating. Glass slippage is another problem because. It is very easy to accidentally nudge the lid of the microwave kiln and cause the glass pieces inside to slip. A microwave oven platen that rotates badly (wobbling or shuddering) can also cause glass to slip. Heating too rapidly may cause glass to crack and move, so is another form of slipping. Any of these (and other) mishaps may result in hot glass “gluing” itself onto the base or the sides of the microwave kiln. You can also achieve the same effect by over-cooking the glass such that it becomes very fluid and “runs” to the side of the kiln to glue the top and base together. Yes folks, I confess. I’ve experienced all these mishaps. The trouble with glass fused onto the ceramic material is that you will find yourself gouging a big hole into the base or sides of the microwave kiln in your attempt to remove the glass. It is rarely possible to remove the glass without damaging the ceramic material, even if you have use kiln wash to protect the kiln base. Such mishaps tend to shorten the life of a microwave kiln, either because you find yourself with a kiln base that resembles the aftermath of World War I trench warfare, or sides where big chunks of the grey heating material are missing. Using kiln wash and fibre paper can help deal with some of the problems some of the time but in my experience they will only reduce the rate of kiln destruction! Another aspect of the deterioration relates to the heating ability of the dull grey gritty substance on the inner surface of the microwave kiln’s lid. It’s the heating element. The dull grey gritty substance is something I’ll talk about in more detail at the end of this blog so for the moment just accept that it is chosen for its ability to absorb microwave energy and re-emit that energy as heat. 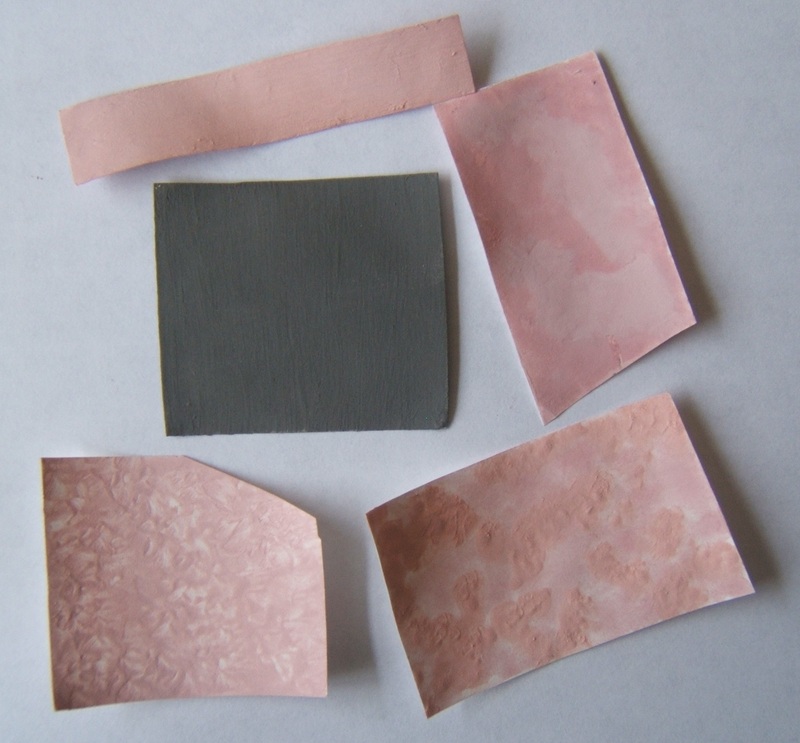 In other words, a microwave kiln works because of a peculiar characteristic of the grey material. I am not sure why, but the effectiveness of the grey “heating” material seem to deteriorate over time, partly because of minor mechanical defects such as hairline cracks, but also because it seems to take longer and longer to heat up as the kiln is used more and more. This is something I noticed with my first microwave kiln but I hadn’t been keeping any records. The fact it takes longer and longer for the microwave kiln to heat up with age implies there is some form of chemical deterioration in the “heating element” part of the microwave kiln. Anything that’s hot and in air tends to get oxidised as a matter of routine. 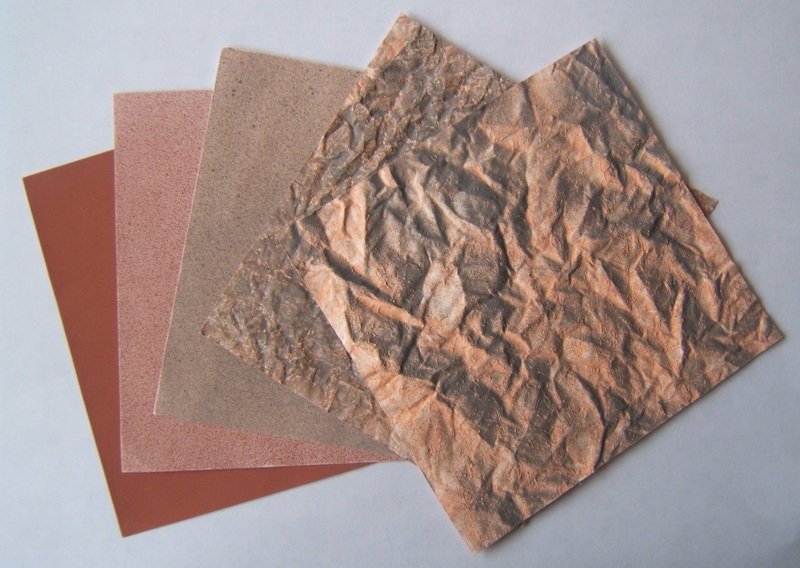 This is perhaps most familiar to you if you’ve ever put some lovely salmon-pink shiny copper elements in your kiln-fired work and was disappointed to discover they came our red, purple or even black as heat and oxygen progressively turned the copper to copper oxide. This is what heat and oxygen routinely do to most things around us. This is what I suspect is happening to the “grey stuff” in the microwave kiln. But I suspect there are two other possibilties. 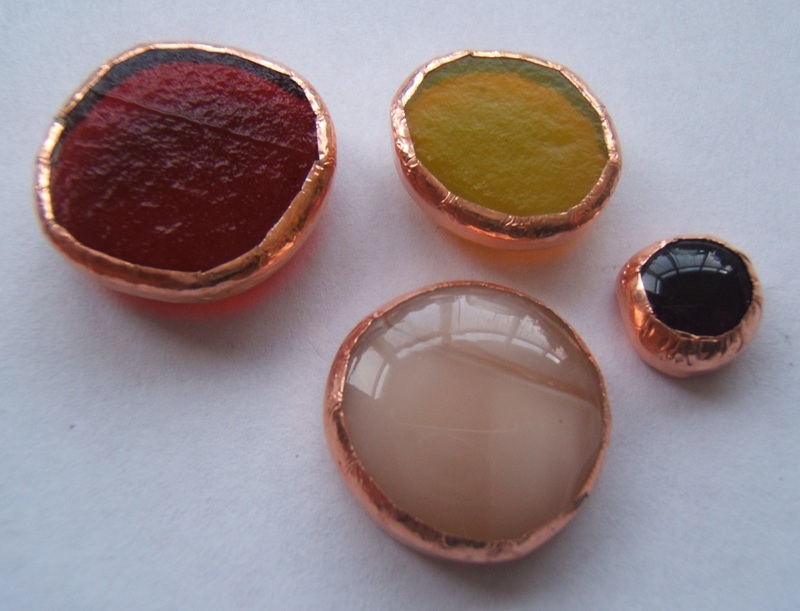 One of the alternative possibilities is that metals in coloured glass are “firing off” and reacting with the heating element. The other possibility is that the mixture of materials in the heating element react with each other causing chemical changes. Whatever the cause, the effect is that the heating element becomes less susceptible to microwave energy so is not able to re-emit heat so effectively. My first microwave kiln told me that there was deterioration. So, for my second microwave kiln, I kept a record of each firing. Not much more than the date, what kind of task and how long it was “cooked” in the microwave. What you see in the graph below is the result of my nerdy record-keeping. Have a look at the graph then I’ll explain what it all means. The graph shows that my second microwave kiln didn’t quite make it to 300 firings before I felt it was time to throw it away. The exact number of times was 283. You can also see from the graph that the jagged curve runs from the lower left (the first few firings) to the upper right (the end-of-life firings). Notice also that the curve is steeply upwards on the left and goes shallow on the right. This curve tells us that a new microwave kiln is much quicker than an old one and that the super-duper performance of a new microwave kiln doesn’t last long. Notice that I’ve scaled the processing time so that 100% represents how quick the new kiln was. This means that when I threw it away it was taking almost twice as long to do exactly the same job – over 180% of the original firing times. Notice also that the graph shows us that the rate of deterioration slows down and seems to be levelling out at around 180%. There are consequences for this “deterioration”. One is that it takes more time and energy with an older microwave kiln when compared to a new one. The other is that there’s no point in relying on detailed accurate firing records with a microwave kiln because its behaviour changes over time. I’ll now reinforce that last paragraph in a different way. If you use a firing time from an old microwave kiln to guide to what you should do with a new microwave kiln you will likely “double blast” your glass. It will be “double processed” and you may end up producing an very runny pool of molten glass. And runny molten glass flows rather well if a surface is not exactly level. This is how I managed to “glue” the inside of the lid of a microwave kiln onto its base using molten glass. Don’t be as stupid as I can be. Consider yourself warned! Now that we have some evidence about how microwave kilns deteriorate, and why, lets look at the economics of using a microwave kiln. There are different brands of microwave kiln and some brands come in different sizes. The kind I’m using has a firing chamber that is about 10cm in diameter and cost about 50 GBP. Knowing that your 50 pound investment will deteriorate and may be ready for landfill after about 250-300 firings is something to think about. So is the ever increasing cost of the electricity, the kiln wash, fibre paper, currency exchange rates etc. I’ve already mentioned 50 pounds Sterling (notice it’s “Pounds Sterling”, not “English Pounds”) as the purchase price of my new microwave kiln and that I got 283 firings out of my second microwave kiln. So, that’s about 17.6 pence per firing due to the kiln cost. But electricity also costs money. I am using an old 650W microwave oven. The 650W measure is the microwave output, not the electricity consumed. From the technical information at the back of the microwave’s manual I see it consumes 1.1kW per hour. So that’s about 60% efficient. My electricity costs around 16 pence per kWh and I’ve factored-in a proportion of the standing charge. We end up with just a few pence of electricity per firing which I can now plot on a graph. I see that the cost starts somewhere between 3 or 4 pence, quickly rises to nearly 5 pence, then slowly drifts upwards to a little over 6 pence per firing. If you compare this graph with the previous one you’ll see exactly the same shape but a different Y-axis scale. This is because we’re doing nothing more complicated by converting a Y-axis in units of time into units of pence by multiplying by a constant value. For full marks in a mathematics exam I should have perhaps chosen a Y-axis starting at 3p rather than zero to make better use of the space. There are other running costs that were not included in the previous graph. We tend to use some kiln wash to protect the base of the microwave kiln. A tiny fraction of a penny per firing for kiln wash is negligible compared to the cost of your time and the other costs associated with running a microwave kiln. You, like me, might also use Bullseye’s thinfire paper between the glass and the kiln surface. It’s expensive and it can’t usually be used more than once. But how expensive is it? If you’re lazy you’ll buy ready-cut 10cm squares at around 11 pence per firing, such as from here at Glass Studio Supplies in the UK but if you compare the price for buying 100 big sheets, such as from here from Warm Glass in the UK, you find you could instead be paying around 6 pence for the same amount of thinfire paper. All it takes is the will to buy in bulk, a pair of scissors and a few minutes of your time. And finally, we need to remember to allocate a portion of the cost of buying the microwave kiln to each firing as well as the electricity cost, both of which were calculated in the previous section. My second microwave kiln tells me to expect a lifetime of about 250-300 firings, or maybe more if I treat the microwave kiln with more respect and care. As most of my use of a microwave kiln is to produce circular blobs of glass, we’re talking “full-fuse-plus”. We might therefore reasonably expect a longer life for the kiln with profile fused work. Record-keeping may be boring and nerdy but it clearly has its uses. I now know the lifespan for my second microwave kiln and how it has behaved from new until the time I threw it away. Combining all the information at current (2016) UK prices tells me that the total per firing will be somewhere in the region of 25 to 35 pence, depending on how old the microwave kiln is, the kind of work being done, and whether or not I am prepared to buy raw materials in bulk. You might like to think about how costly it is to fire-up your “big kiln”. The same ideas and methods apply, but the numbers will be bigger. If you’ve got this far and have an urge to find out more about how microwave kilns work, and would also like to know how you can make your own, you’re in luck. I’ve gathered together a few links below which I’ll pad out with some commentary. When you hunt around the Internet you’ll maybe find some misleading information about “the grey stuff” in a microwave kiln. The grey material is not granite, nor is it graphite. It is a mixture of silicon carbide and sodium silicate. Notice I say silicon and not silicone. Silicon is a shiny silvery metal. Silicone is a kind of plastic used for waterproofing products, breast implants and more besides. Silicon and silicone are not the same things. You will be familiar with silicon carbide as an abrasive if you’ve ever tumbled rocks and minerals. You will also be familiar with sodium silicate though it’s unlikely that you realise it. Both are inexpensive chemicals that you can buy on eBay and I’ll give you a couple of links later that tell you more about both of them. Once upon a time I found a reference to both these materials when I was reading something about LVR Products’ Micro-Kiln EZ-5 and Micro-Kiln No 9. I made a note that in their parts list it said there was a ‘Repair Solution Set’ which consisted of Silicon carbide (solution A), Sodium silicate (solution B) and a Brush. I forgot to make a note of the URL and I can’t find with Google any more, so I’m sorry I can’t give you a link to this evidence. But not to worry. I have more sources of information that should reassure you I’m not talking out of my backside. Silicon carbide is used as the heating element because it has the interesting property of absorbing microwaves and re-emitting the energy as heat. You can find out more about this grey “heating” chemical at Wikipedia’s entry for Silicon Carbide (especially in the Heating Elements section). You will also find silicon carbide mentioned in some of the links listed below. To “glue” the silicon carbide to the microwave kiln lid requires a binding agent and although there are several possibilities, you will you find that the commercial repair kits seem to use sodium silicate. Find out more about this “binding” chemical at Wikipedia under Sodium Silicate (especially in the Refactory Use section). Over at Paragon you will see repair instruction that mention a silicon carbide layer. Actually, this is a very useful little instruction manual for any microwave kiln user, not just the Paragon MagicFuse microwave kiln. You can get a really good insight into how microwave kilns are made by watching a YouTube video called How to make a microwave kiln (Furnace) from scratch for £5. The audio is not good but it is worth the struggle. Not only will you see a microwave kiln being made but you discover silicon carbide is just one of many “susceptor” chemicals that can be used as a heating product and that there are different binders, not just sodium silicate. Also interesting in the narrative is an explanation of how the same heating method is used to cook microwave chips. You can find out more information about microwave absorbers here though in a completely different context. If this isn’t enough for you then there is an old technical reference about “self heating” ceramic crucibles for microwave melting of metals and nuclear waste glass at the Office of Scientific and Technology Information in the USA which is not as irrelevant as you might initially suspect. Vitrification has for many years been considered as a “safe” method of disposal for nuclear waste materials. For the fearless amongst you, I have found some rather technical references. I can promise you an especially dreary read with this patent. If it is too much for you, I suggest try the readable article here because they’re both about the same thing. And finally, we should give some thought to whether microwave kilns are good value or not. The same applies to repair kits that you might encounter. For almost the cost of buying a replacement microwave kiln you can buy a microwave kiln repair kit. One example is here. I am always suspicious of spare parts and repair kits that cost almost as much as the original item. If you have a look in eBay (or elsewhere) you’ll discover just how cheap silicon carbide and sodium silicate really are. This should make you wonder why there’s such a big difference between the price of these raw materials and the price of a commercial kit or a microwave kiln. If you understand the instruction in the YouTube video I mentioned in the previous section you’ll begin to understand that 50 GBP is ten times the cost of making your own. Again, this should make you wonder why there’s such a big difference between the price of the raw materials and the price of a commercial microwave kiln. Yes folks. Information is power. The power to exploit. And now you know their secrets they can’t exploit you so easily. But you can exploit what you know. You too can make a microwave kiln. You too can buy the materials you need to make your own repair kit. If you enjoy making things and you don’t have a microwave kiln then making one is surely a candidate for the top of your “Things to Make” list. Bye for now. Tomorrow I’m going to make some rainbows. How about you?